Merry Christmas from all of us! From all of us to all of our saddle pals out there, we wish you a Merry Christmas and a Happy New Year! As 2008 draws to a close, we here at the old ranch and the rest of the gang at Hawgleg look forward to 2009. The past year has had it's ups and downs for us personally and professionally. Still, we've managed to keep the coffee hot, and our powder dry through it all. 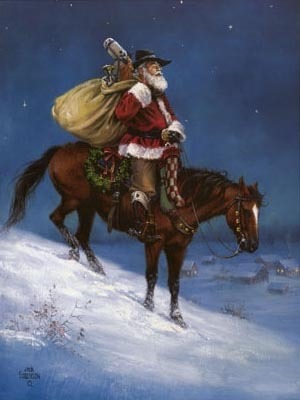 We look forward to the wonderful opportunities that 2009 will bring us to serve you, and all of us here, (even Grumpy Ol' Doc Murphy), wishes everyone (and all of our saddle pals), a very Merry Christmas and a Happy New Year. Please take a moment out of your busy Holiday Season to say a prayer for the safety and quick return of our troops in harms way. May your Christmas season bring you joy for all the good that you were blessed to receive in the past year. May your heart be warmed by the love of family and the fellowship of good friends. Above all else, may the Lord open your heart to the promise of hope for a new year and the blessings yet to come. Hawgleg Publishing will be closing tonight for the holidays and will not reopen until Jan. 5, 2009. Some of us may pop in from time to time to chat or read messages, but that's strictly "as time allows." Additionally, Mike Mitchell will be traveling 12/27 thru 1/1 and will not have any Internet access during that time. While on break we will not be filling any orders or conducting business. Both Mike Murphy and Paul Mauer will keep an eye on things here, and our buddy Judge Roy Bean will help keep an eye on spammers in the forums (thanks, Judge!). In general, things should be pretty quiet around here for the next two weeks. We wish you a Merry Christmas and a Happy New Year, and we're looking forward to another great year of slinging lead and tossing dice!